The Afro-Creole tour starts sacred ground of Congo Square at 9:00 am. This two hour tour will explore the contributions of the Afro-Creole culture. Your tour will then proceed to the oldest active cemetery to discuss voodoo, music and the beginning of the civil rights movement in America. Enjoy two hours of history, culture and traditions of the Afro-Creole community. This tour brings to life the experiences of the West African people who played a major part in the formation and foundation of what we know as Jazz. Hear the history of how this art form started and how it has changed over the years. 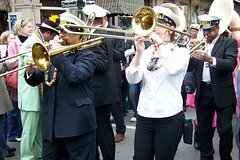 Learn to second line as we head to the cemetery to hear the story of Voodoo, how it came to New Orleans and why it is still practiced today. Learn of the brave men who challenged the Jim Crow laws that sought to suppress their freedoms and how we came to have the first bilingual newspaper in the country. Discover what makes this culture unique by delving deep into the history of some of our most famous families. Hear first hand accounts of tradition, superstitions and customs from your tour guide who's family goes back 6th generations in the area called Treme.